Finally, after over thirty “Palmer’s Picks” under my belt, I took the plunge and did a proper interview. And I really couldn’t have asked for a better subject than Paul Pope. 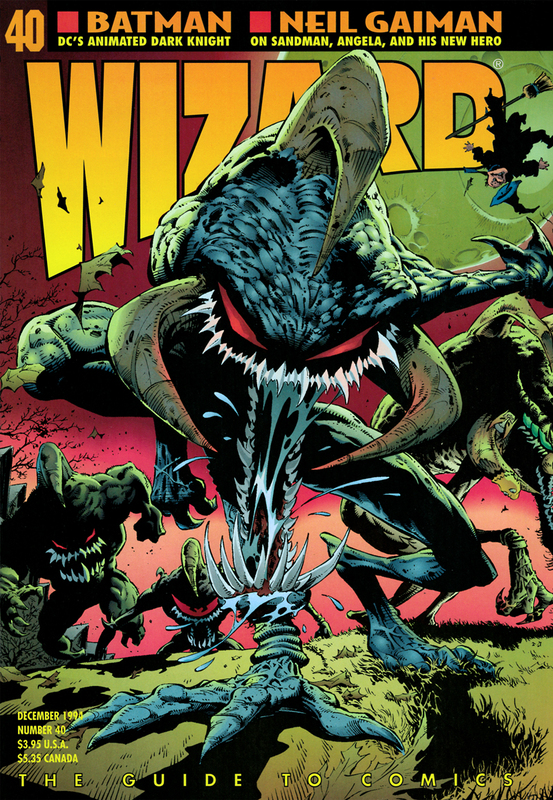 Greg Capullo followed up his cover of the previous issue with this rendition of Spawn‘s Violator brothers for the cover of Wizard #40. Even at this early stage of his career, it was clear that Pope wasn’t like any other cartoonist out there. While most would usually make their debut with a comic series or maybe a few short stories for some anthologies, Pope decided to launch onto the scene with a self-published graphic novel, Sin Titulo. And then he followed it up with a longer one, The Ballad of Dr. Richardson. By the time Pope was ready to launch THB, his first comic series, there was a lot of buzz around his work. To build on that buzz, Pope contacted me in hopes of getting some coverage in Wizard. He sent over a nice, big stack of stuff: his two published graphic novels, some promotional posters and trading cards, a few press clippings, and a pile of Xeroxes of material that would end up in various issues of THB. There was also some work that has never seen the light of day, including a few pages of an early version of what would become his Vertigo series Heavy Liquid and the still-unpublished Kirby Kansas. 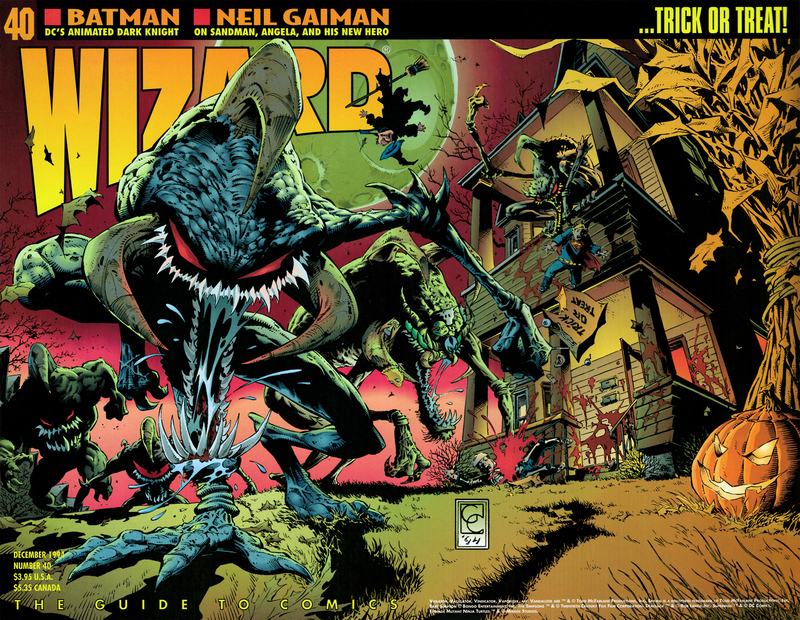 Wizard #40, released in October of 1994, featured a Halloween-themed gatefold cover. The amount of comics that Pope produced was staggering. The debut issue of THB, from late 1994, was over 100 pages and all of the following issues clocked in over 50. He stuck with a more-or-less monthly schedule for the first five issues of THB so that’s about 300 pages in less than a year, not to mention the handful of stories he contributed to various anthologies during the same time period. It’s an amazing amount of work, and it’s even more amazing that it’s all so good. Pope was clearly an ambitious creator and it’s fascinating to glimpse—alongside the published work—all of the things that didn’t come to fruition while he was working on THB. In my original “Picks” reprinted below, there’s mention of Prelude to Icarus, Kirby Kansas, and The Dragonfly, all of which never got off the ground. Even the plans for THB were always in flux. The original advertising for the series promised “special pull out comic sections, inserted ‘filmstrip’ comics, stickers + trading cards, more stuff too complicated and cool to mention!” Well, some of that stuff might have been a little too complicated because none of it was included in THB. When I spoke with him on the phone, Pope even proposed a contest with Wizard to coincide with this “Palmer’s Picks” but it never came together. At one point there were plans to release THB-A and THB-B, two trade paperbacks collecting the series and all of its side stories. The books were never published, but the letter designation was carried over to the long-delayed sixth and final issue of the series. When that one finally appeared in 2000 it was split into four separate comics: THB 6a, 6b, 6c and 6d. The THB saga has continued in various forms since then, including a few one-shots and several oversized comics, but it still remains unfinished. A four volume, full-color collection and completion of the series was announced back in 2007 but nothing has appeared since then. Keep an eye on Pope’s recently launched website for THB. Maybe something will happen soon! What do you get when you combine a 13-year-old girl, her inflatable purple bodyguard, an anthropomorphic Steinway piano, and an army of bug-eyed bureaucrats (among other things)? You can find the answer in THB, a serialized “drawn novel” created and published by Ohio-based comic artist Paul Pope that promises to be one of the most bizarre and entertaining comics of the year. Pope draws a definite line between the imaginative world the children perceive and the “real” world populated by adults. In some scenes featuring adults, for example, the angle of perspective shifts to show that they are merely on a stage set with lights, a catwalk, and sandbags. “When I start drawing, I’m real spontaneous about it. I’m tapped into a creativity I can just trust,” explains Pope. And he has every reason to trust his instincts. In the short span of a few years, he has become one of the most talked-about artists in the industry, earning praise from an impressive group of creators, including Will Eisner, Dave McKean, and Robert Kanigher. Pope probably earned most of the buzz simply because he is a unique creator in this current age of young cookie-cutter artists who cite Jim Lee or Todd McFarlane as a major influence on their work. The twenty-four-year-old artist says that he draws inspiration from such renowned masters of the art form as Alex Toth, Jack Kirby, and Hugo Pratt. His work is fresh and exciting due not only to the fact that it has firm roots in classic comics, but because he also draws influence from “legitimate” art and literature (yes, readers, there is more to life than comic books). Pope’s inspiration from philosophy, art, and literature is evident in his first two graphic novels, Sin Titulo (which means “untitled” in Spanish) and The Ballad of Doctor Richardson. The protagonist of Sin Titulo travels to Mexico in search of evidence to back his claim that American author Ambrose Bierce was a Marxist. The Ballad of Doctor Richardson (an “answer” to T.S. Eliot’s poem “The Love Song of J. Alfred Prufrock”) is a romantic work that recounts 12 hours in the life of an unsuccessful college professor who changes his fate by holding onto a fleeting moment with a woman on a subway. Both works have realistic plots, but are set in the near future, bringing a small science fiction twist to the narrative. The fantasy elements in these books, however, are downplayed in favor of a story grounded in character interactions. With THB, Pope has created an imaginative world populated by a strange cast of characters. In fact, he has created so many characters that he won’t have room for all of them in one series. After the completion of the initial six-issue THB story, Pope will publish Kirby Kansas, “a comic book read by people on Mars,” and Heavy Liquid, a series with a darker, more “surreal and relentless” tone than the rest of the THB material, something which Pope has been asked to prepare for several major companies. Pope has not yet amassed a large body of work. He had a few strips published in a couple of small press magazines before he established Horse Press to publish his own work, using information he gathered on how to start a small business. Unlike many self-publishers, Pope takes an active part in aggressively promoting his work. He enjoys thinking up new ways to involve the reader, such as trading cards, postcards, and posters that help flesh out the story and make reading each comic a three-dimensional experience. By the way, THB stands for a peculiar word Pope himself created: Tri-Hydro-Bioxygenate, which is supposedly a ball that explodes into a little person with the addition of just a few drops of water (kind of like a cross between a genie and a Sea-Monkey). Just as fascinating as the buzz around THB is Paul Pope himself. An intensely ambitious and uniquely gifted creator, Pope should have a very bright future ahead. Let’s face it—with all of the good word surrounding his work, it’s going to be impossible not to notice Paul Pope in the next year. If you’d like to respond to anything I’ve written lately, you can drop me a line at Palmer’s Picks, c/o Wizard Press, 151 Wells Ave., Congers, NY 10920-2064. Boom Boom #2—Rising star David Lasky uses the legendary Jack Kirby’s style to tell the story of the difficulties encountered by author James Joyce while writing his novel Ulysses. David’s first issue was a top-notch debut, and this issue promises to surpass it. If you can’t find a copy locally, send $3.25 to Mu Press 5014-D Roosevelt Way NE, Seattle, WA 98105. From Hell: The Compleat Scripts—If you have read From Hell (Alan Moore and Eddie Campbell‘s horrifying dissection of the Jack the Ripper murders) in comic book form from Kitchen Sink Press, you are only getting half the experience. From Hell: The Compleat Scripts from Borderlands Press presents Alan Moore’s original script for the comic. In some ways, this book is even more precise and satisfying than the comic, since it relates subtle gestures and motivations for characters that are impossible to convey in a comic. This is a unique book, the first to spotlight a comic writer’s full script, and it is a valuable insight into the creative process. If your local comic store can’t find a copy for you, you can get in touch with Borderlands Press at P.O. Box 146, Brooklandville, MD 21022 (or 1-800-528-3310 for Visa/Master Card orders). Book one of the four-volume From Hell: The Compleat Scripts is available now in a limited-edition, signed, numbered, and slipcased hardcover for $95, as well as a softcover version for $14.95. Tom Palmer Jr. is a freelance writer from New Jersey who can boogie till the cows come home. Cages by Dave McKean; Nexus by Mike Baron and Steve Rude; Strangers in Paradise by Terry Moore; Rubber Blanket by David Mazzucchelli and others; Corto Maltese and other works by Hugo Pratt; Little Ego and other works by Vittorio Giardino; Tyrant by Steve Bissette; and Optic Nerve by Adrian Tomine.